This spreadsheet calculates the amount of thermite needed to vaporize a bicycle. Most people light their thermite with burning magnesium. As we found in testing, this is a very unreliable way to get the job done. The magnesium often self-extinguishes. Last weekend, we successfully tested a pyrotechnic mixture that will work every time and give us split-second control over the firing sequence. Watch the video to see the tests. Makeshift Lab workbench with bicycles. 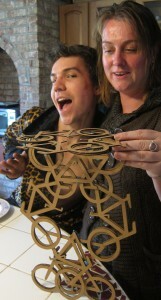 We have undertooken the first step in the creation of Bicycle Holocaust. 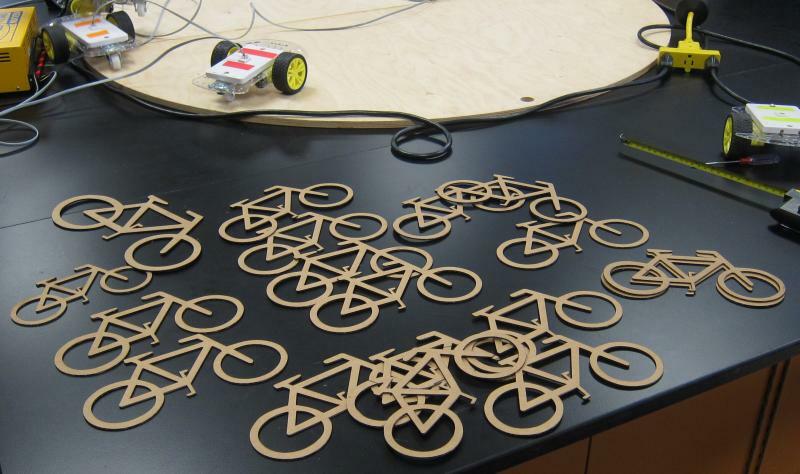 Doug Borzynski of the Makeshift Lab at the Buffalo Museum of Science loaned us the use of his laser cutter to cut out 19 cardboard bicycles. Each bicycle is 8 inches (20 cm) long. 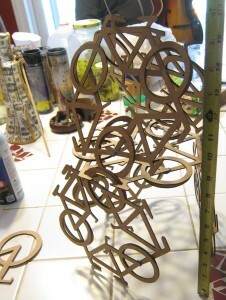 We will use them at the next Töad Meädow art build party weekend to assemble a model of the final sculpture.